But don’t give Satan the credit. 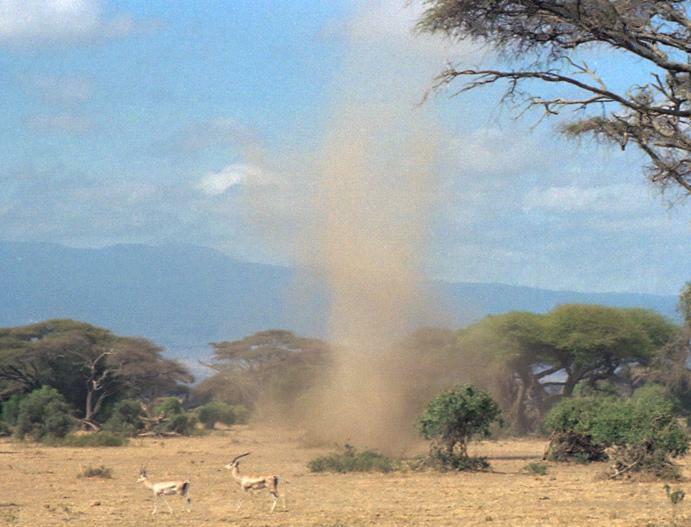 A dust devil is actually a special type of dust storm. Instead of sweeping across the terrain as a broad sheet of blowing dust and debris, it is made up of dust that whirls in the form of a spinning column. Such “devils” occur during the hottest months throughout much of the world’s deserts and plains – wherever large, dry surfaces of earth are exposed to a searing sun. Once conditions are ripe for these storms to form, several of them usually spring up at a time. Although Burchardt claimed that the dust devils ascended into the clouds, we have never seen one form on a cloudy day. While we’ve watched hundreds (if not thousands) of whirlwinds snake their way across the landscape, the weather conditions have been the same – very hot, with few clouds available to filter the glare of the sun. But these whirling storms certainly do stretch heavenward. Dust devils reach so high that if one were made of rope instead of dirt, Jacob could have climbed it instead of a ladder. The principles of nature that enable these whirlwinds to form are simple. If you’ve watched birds or sailplanes soar in a circular pattern during the heat of the day, you’ve already studied air thermals. Here’s how they work. Each summer morning the sun renews its daily assault, and gradually its heat causes an unstable layer of hot air to form just above the earth’s surface. Because it is lighter than the cooler air above it, this hot air would “like” to rise, but it can’t. But wherever there is a break in the cooler air, “bubbles” of warm air begin to waft upward, creating thermals. As the hot air rises, it leaves a vacuum, and its former location is quickly filled by rushing, cooler air. Once the stage is set for a whirlwind to form, one more “cymbal crash” is needed to start the drama. It can simply be more sun, or the sudden sideways swish of air produced by a passing truck that causes the “top ” to start spinning. Some dust devils are born in grain fields that are being burned after harvest, or by the heat of natural grass fires. Sometimes they are purposefully formed by man. The Apache Indians reportedly triggered devil winds intentionally by setting fire to the spines of a large cactus. The actual structure of a whirlwind is complex. It includes an inner column of cooler, falling air, which is surrounded by a rising sheath of hot, often dirt-filled air. A devil can stretch as much as 1,000 feet skyward while maintaining a diameter of not much more than one yard. It appears to be a dust column, a sand rope, or an outside-in look at how water goes spiraling down the drain. It takes a continuous source of hot air to keep a really impressive dust devil walking over the earth’s surface. Some whirlwinds last for only a few minutes, while others strut their stuff for more than an hour. At times, one will see two devils join forces, but rather than doubling their power, they effectively neutralize each other. On rare occasions, dust devils are invisible (leading one to think that perhaps something devilish is going on), but the reason they can’t be seen is that there doesn’t happen to be any loose dirt around to take a free ride. Most of the time, however, a dust devil is as dirt-filled as its name implies. As the column of air rises, it vacuums up anything that it can carry aloft. It’s common to see dust, sand, paper, and plastic in them. Once we noticed an aluminum lawn chair spiraling gracefully toward the sun. If all of this sounds fairly benign, don’t be misled. A strong dust devil can be as windy as one of its larger cousins, a tornado. It may lack the energy needed to rip a building off of its foundation, but there have been reports of dust devils overturning trailers and tearing off roofs, and then littering the debris all over the countryside. We’ve seen nothing so frightening. However, when you drive through one of those little twisters, you’d better have a firm grip on the steering wheel. You may suddenly find that you’ve changed lanes – possibly into the lane of oncoming traffic. Having said that, we’ll close this scientific discussion with the assurance that dust devils are much more likely to be interesting than fearful. And now for an old Indian legend. Ventana Cave in southern Arizona is reputed to be the birthplace of whirlwinds. The early residents of the area claimed that when their gods became angry, they spewed devil winds out of the mouth of the cave. And paleoarchaeologists agree that this phenomenon does occur at the cave. Because it is an important archaeological site, the cave has held scientists’ interest for more than 50 years. During that time, numerous scientists have watched as tiny eddies of dust came to life deep within the cave, gradually gained strength as they rose to its mouth, and then vacuumed up wheelbarrows and tools in a final exuberant burst to freedom. But how can this phenomenon be explained by the modern theory of the origin of whirlwinds? The leader of one expedition, E. W. Haury, suggested that a fire built in a certain part of the cave triggers this action. He pointed to the archaeologists’ discovery of a zone measuring approximately two yards square that is completely free of ashes – no matter how deeply they dig – even though it’s situated in the midst of an area where fires burned repeatedly throughout all of the centuries of man’s habitation. So, perhaps even this strange source of whirlwinds fits the larger pattern. Very interesting. Thank you, Lowell.